Listing 13.3. The browse page. As you see, the only real difference with this page is the mv_searchspec field. Rather than provide an empty text field here, you assist the user by providing a list of categories from which to choose, as you can see in Figure 13.3. You might be curious about the [finish-order] MiniVend tag in these last two HTML files. I explain this tag in the next section on displaying the search results. Figure 13.3. 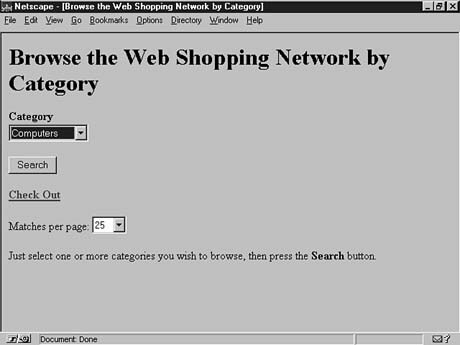 The Browse by Category page.